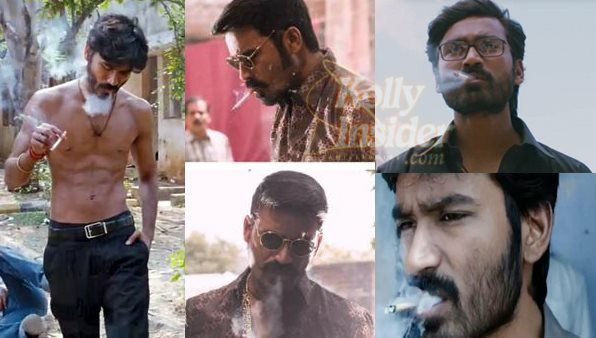 Dhanush’s Maari teaser which was released recently introduces Dhanush with a cigarette in his hands. Though the teaser is getting good response and reaches more than 2.5 lakh views, there are criticism from his fans as it shows him smoking cigarette. The teaser, which lasts less than a minute, shows Dhanush gearing up for a stunt-sequence as he emerges from behind a parked vehicle which is smashed by goons. Critics say that Dhanush, the national award-winning actor, has to display some sort of responsibility towards the society by staying away from featuring in smoking sequences. Smoking and drinking scenes in Dhanush films are not new. Already, Dhanush courted controversy by featuring in smoking sequences in his hugely successful Velaiyilla Pattathari last year. The posters of VIP featuring Dhanush smoking cigarette were posted in nook and corner of the Chennai city and later it was removed. Dhanush was asked not to have such scenes in his movies. Besides VIP, 'Mariyan' and 'Anegan' had such smoking scenes. After doing the same in Maari teaser, there are lot of oppositions in social networks condemning the same. Critics say that Dhanush, the national award-winning actor, has to display some sort of responsibility towards the society by staying away from featuring in smoking sequences. They want to know whether Dhanush is of the strong and misplaced impression that smoking alone is a sign of manliness.